You already know that social networking sites have been getting huge around the world, but an annual report out today from comScore shows what exactly is going at a wonderful new level of detail, with surprises for even long-time industry watchers like me. Within these big numbers, though, all sorts of differences emerge. 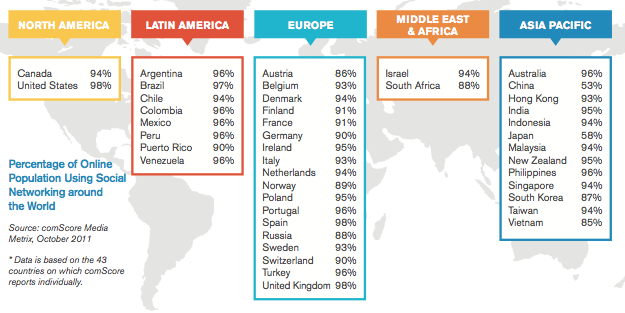 People in Latin America spend an especially large portion of their time online on sites like Facebook and Twitter — 28%, or 7.6 hours per month. That’s much less the case in Asia, where it’s 11% and less than 3 hours per month. Those are broad averages, and full of anomalies. The Philippines, for example, is actually the most socially networked country in the world, with 43% of users time going to these services, and above 8.7 hours. Facebook itself is making up the largest portion of all this usage — even as all sorts of rivals and alternatives are surging. The service reached 55% of the worlds’ online population in October, with incredibly high engagement: 3 out of every 4 minutes on these types of sites, and every seventh online minute. For the most part, it has surged into first places across countries that had previously been on rival sites, like Orkut in Brazil. But Facebook is running out of new users in North America and Western Europe simply because it has so much of these markets already (even though it’s not running out of users’ attention). 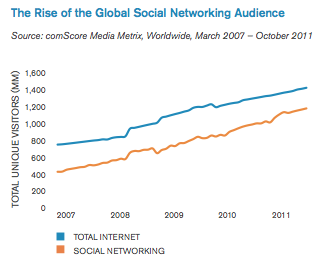 In the meantime, a whole other crop of social sites are booming everywhere, led by Twitter. The microblogging service has grown by 59% in the past year to reach 160 million monthly unique users worldwide. Professional social network LinkedIn has grown by 55% to nearly 100 million. Easy-blogging site Tumblr is up 172% to nearly 40 million; Chinese Twitter-style site Sina Weibo shows almost identical growth (albeit mostly in China). Report co-author Andrew Lipsman says this is one of the trends that was most surprising to him about the report. There’s more and more people who want to share around interests, not just the close social relationships. All in all, many of these market leaders are also showing just how global they are these days, with Twitter and Facebook each now having 80% of their users outside of the US. – Google+ now has 65 million users worldwide. That thing has some legs, even if we don’t always see them here at TechCrunch. – Women continue to lead men in engagement across the world — by 2 hours or 30% per month in North America and Europe. This is a long-term trend that comScore has seen across older services like instant messaging. But, men have shown a 10% bump since July of 2010, and they gradually appear to be catching up. A lot of this has to do with age. Usage is about at equilibrium among younger age groups, Lipsman notes. – Mobile is crucial to usage in many markets and growing, but continues to account for a minority of overall usage. Between a quarter and a third of users in Western markets reported accessing social networking sites at least once a month from mobile devices. – Ads are still playing catch-up to spending levels per traffic that you’d expect to see in other areas. – Email usage has been declining in usage among younger age groups, a trend that’s not likely to change. This is by no means all of the interesting data in the report. You can download the full thing on comScore’s site, here. I should note that it deserves credit for doing an especially good job providing easy-to-read data visualizations — something that you don’t see often enough amidst all the awful infographics out there. ComScore’s methodology, considered by many to be the best in the measurement business, includes large-scale opt-in user sampling around the world and across desktop and mobile devices.